Driving while either intoxicated or drunk is dangerous and drivers with high blood alcohol content or concentration are at greatly increased risk of car accidents, highway injuries and vehicular deaths. Safety seat belts, air bags, designated drivers, and effective practical ways to stay sober are also discussed. 16% of motor vehicle accidents a year are caused by alcohol abuse. More than 6,000 alcohol-related accidents are registered each year in Cancun, resulting in thousands of injuries and material damages. 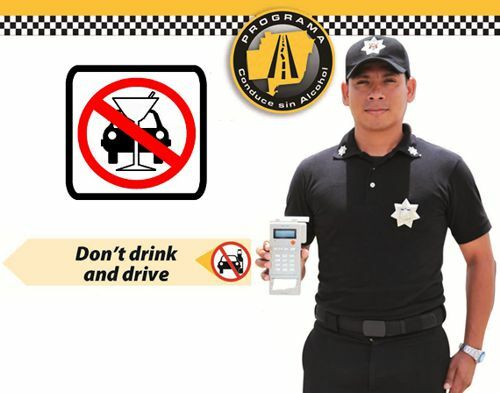 In Cancun the government is concerned for your safety!, the County of Benito Juarez implemented the breathalyzer test program to protect civilians and prevent alcohol-related traffic consequences such as death, injury, and costly material damages. Fully-equipped check points with electronic surveillance is installed throughout the city. Traffic wardens randomly select drivers to verify blood alcohol levels first through interview, then, if necessary, by electronic breathalyzer machines. If machine verification is necessary, data pertaining to the driver, traffic warden, and vehicle will be entered and a receipt issued. The sanctions: Drivers who do not pass the test will be detained for a non-negotiable period of either 20 or 36 hours (depending on the alcohol test results) in Cancun’s Detention Facilities, as in accordance with the “zero impunity and zero tolerance” policy.